Shower Enclosures, Shower Systems, Shower Trays. Shower Enclosures, Shower Systems, and Shower Trays. Showers have come a long way over the last few years, no longer restricted to the small cramped square cubicle lurking in a cold corner, feast your imagination on the new ranges available. "With the new water saving regulations, shower enclosures are, not only a welcome additional feature but, in some cases a necessity." With the large range of cubicle sizes available, not only squares, but also rectangles and quadrants, almost any room can accommodate a shower. Always look out for the new features that save you time and effort. There are features that help with cleaning and maintenance, such as doors that swing out at the base for cleaning and glass that is 'easy clean' helping the glass staying fresh without scrubbing. Always consider the door opening. If space is restricted consider inward folding, sliding, or bi-fold doors. 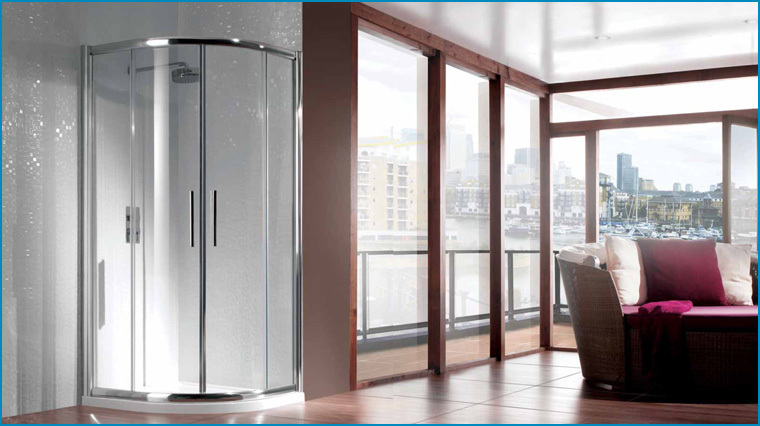 As always our experienced shower adviser is on hand, should you need further information on planning or installation. Many people have wanted the 'continental' look and feel of a wet room or walk in shower and, with modern shower trays and wet-room specialist materials you can. Due to new technology in shower tray manufacture (see shower tray section) large walk-in, low profile shower trays can be utilised up to bath size. 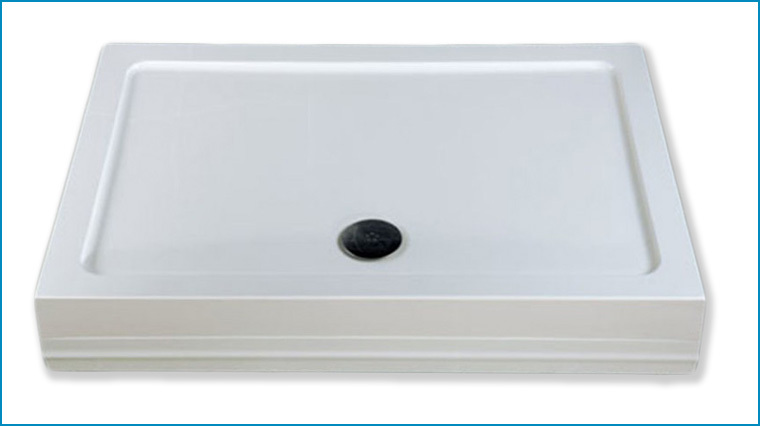 With a wet room kit the whole area can be a minimalistic wet room with no visible tray. The beauty for the wet room is the simplicity and clean look, with a simple glass screen to deflect water away from the WC or drying area. 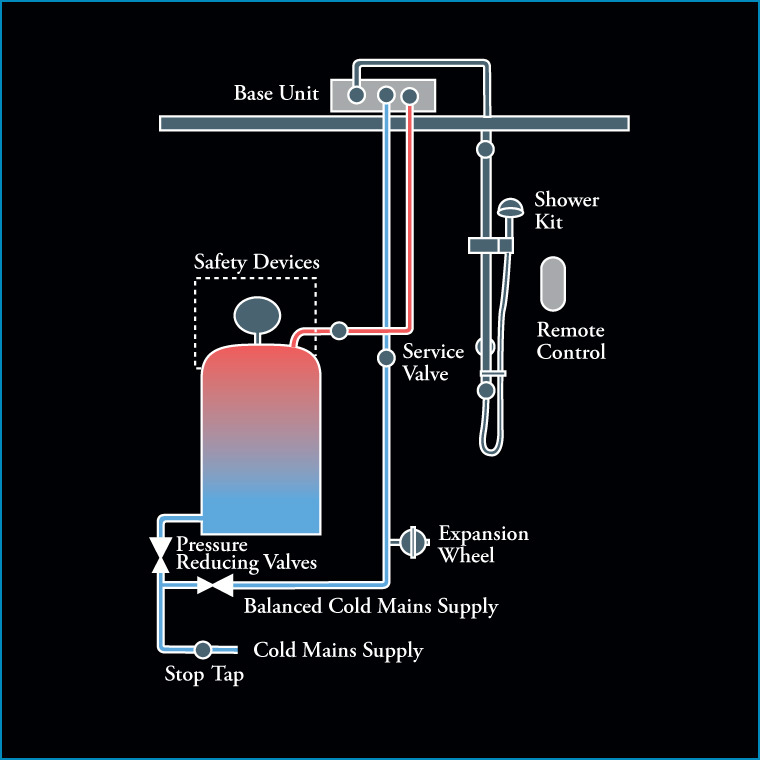 "The correct shower system to match your hot water and heating system is vital. Usually three types (but there are exceptions!)" 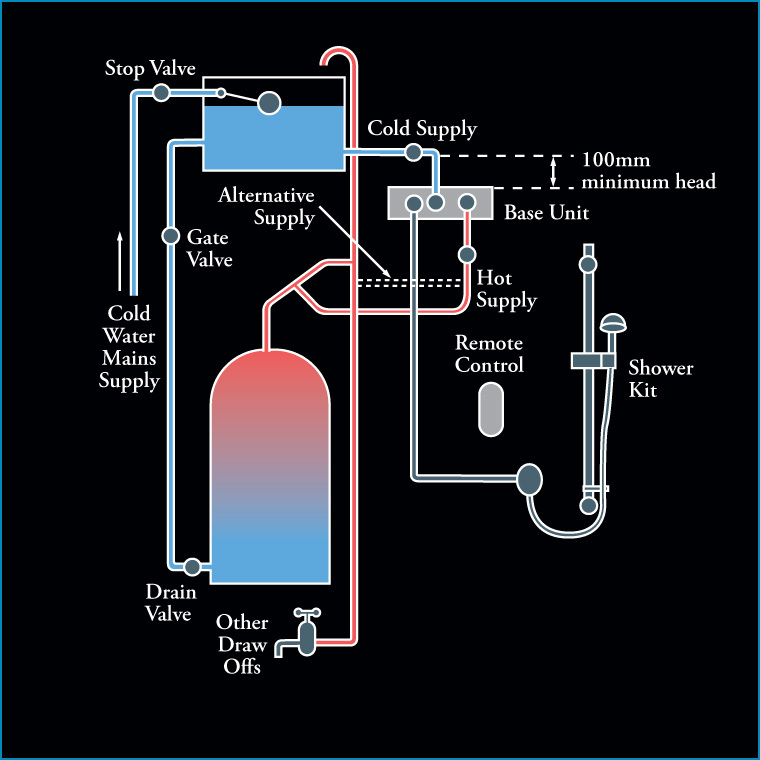 Traditional systems in the UK are classed as 'gravity', with this system if you have an airing cupboard with a large copper tank normally with a lagging jacket of foam insulation on the outside to retain heat. You will find a large water tank in the attic that you with a ball valve that will refill when you run a bath or basin tap (but not the kitchen tap!). Look for a wall mounted boiler and notice that it will ignite (start to heat) when you run any hot tap. 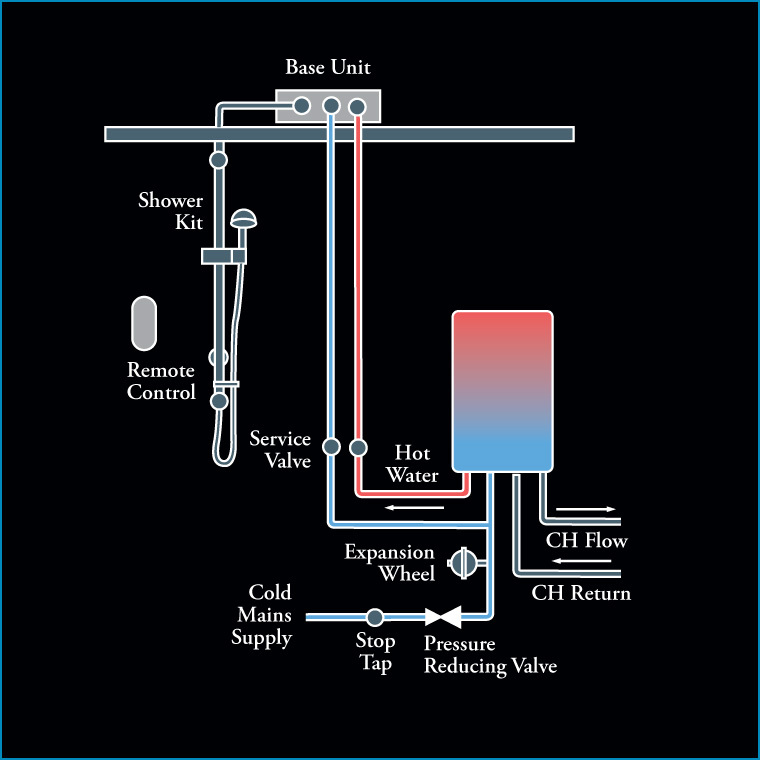 This system has no large cold or hot water tank. This system will have a large tank normally in an airing cupboard, but is not visibly covered with lagging, and will not emit much heat, if any. In the attic there may be a small water tank (but not a large one) this small tank will not start to fill when you run any tap. Note this is a general guide and there are exceptions to the above rules. Always ask an experienced plumber if you are uncertain. "The thin, bendy plastic shower tray has been left in the past. New methods of construction have brought shower trays bang up to date." This well trusted construction consisting of a thick hard wearing gel coat applied to precision mould then backed with a solid resin and stone material is a trusted favourite with installers and users alike. The finish is HI gloss with a feel similar to ceramic. Installed correctly on a 19mm base board of ply and then bedded on sand and cement this tray is quote often guaranteed for 40 years against cracking. Some manufactures offer a damage repair kit for this type of tray in the unlikely event that you damage the surface. 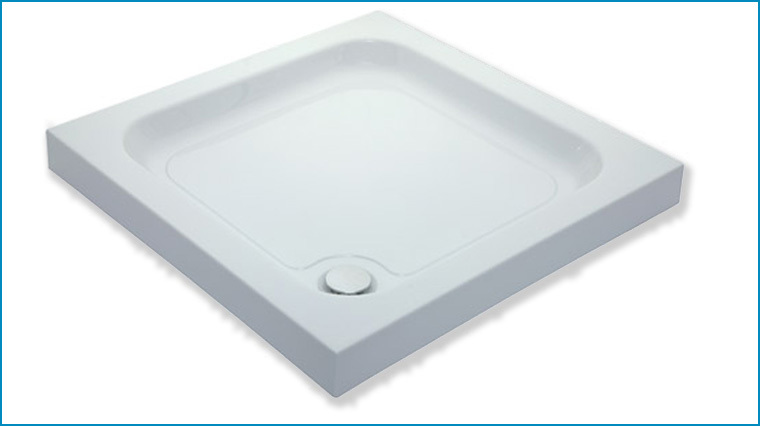 A plastic (acrylic) shower tray is formed then turned upside down and filler with a polymer/resin compound. The overall appearance and installation is similar to the stone resin tray. Although strong and ridged these trays are much lighter to install than the stone resin tray. A combination of a tough stone resin and a ABS acrylic-capped tray designed and manufactured to produce a hard wearing, anti-scratch, hi-gloss, Non-discolouring surface. 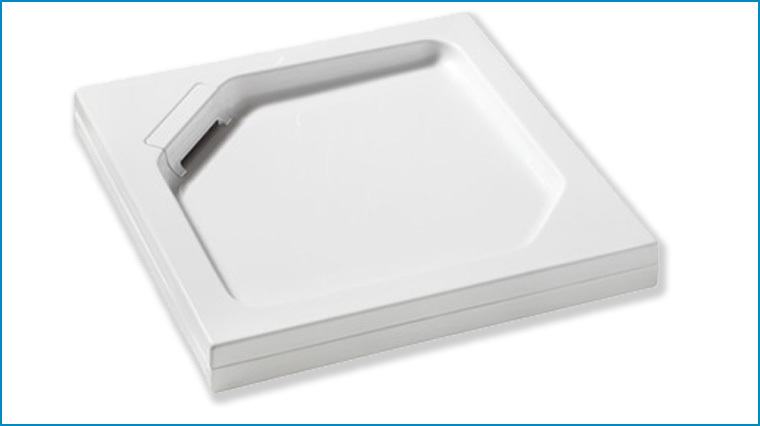 All of these trays are available in a large range of squares, rectangles, and quadrants. It may be important to ensure that the waste position is in the best place for your installation. Also consider what height you require the tray ranging from a slim 45mm to a classic 80mm. T/A The Crowborough Bath Shop. Crowborough, East Sussex, TN6 1JT. UK.